Amazing high-tech friend to guard your room or perform any number of its 20 programmable actions. This fun 14-inch tall bot is an I/R remote controlled wonder with a powerful LED light on its shoulder and a feature-packed remote controller. 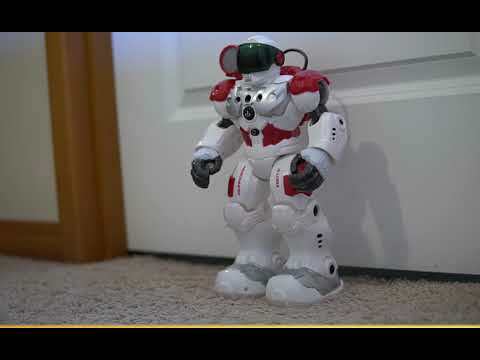 The bot can be programmed to perform up to 50 actions at once, and even has a spy function that can record up to 20 seconds of conversation from a distance. With the 20 function I/R remote controller, you can make your new buddy walk, talk, move its arms, and even dance. Boogie down during the day, then set your bot to Guardian Mode at night. The Guardian Bot is a high tech buddy with plenty of personality! Box Size: 14" x 13.5" x 5.5"